“Blame” has certainly been a theme of many school reform discussions — including blaming teachers and blaming parents. Here are some commentaries on why no one, including teachers, should get sucked into that morass. 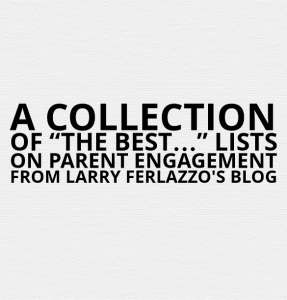 You might also be interested in seeing all my parent engagement-related “The Best” lists here. Parents Are Our Allies is a post I wrote excerpting an article by Pedro Noguera. Parents Aren’t to Blame for the Achievement Gap: A History of Injustice Is! is the titled of a piece in the Huffington Post written by a teacher. It a good perspective on look at the assets of parents, and the importance of not “blaming” them. Teachers Have Got To Stop Blaming Parents is a post I wrote. Next, let’s go after the parents! is a good post by my Sacramento colleague Alice Mercer about one of the ramifications of the ongoing school reform debates. “Parents Agree – Better Assessments, Less High-Stakes Testing” is a post I wrote about a recent survey. For every irate, blustering, nasty parent you’ve encountered, I guarantee you there are 2 or 3 or even 9 who feel differently. And a lot of them will have your back, stand with you, speak out for you, support you fully: but you have to approach them, one on one. You have to make the first move, reach out, and ASK their help. Teachers and Parents: Natural Allies in Defending Our Schools is a useful post by Anthony Cody at Education Week. On a Saturday afternoon in early March, some 60 people packed into a classroom at a technical high school north of Saint Paul, Minn., to discuss the strategic course of Saint Paul Federation of Teachers (SPFT) Local 28’s upcoming contract negotiations. The remarkable thing is that most of them were not card-carrying union members, or even teachers. They were students, parents and community activists concerned about their schools and the attack on public education. The answers from the two groups mirrored each other. They called for wages and working conditions that sustain a teaching career and long-term professional growth, smaller class sizes, a focus on interdisciplinary and experiential learning, an emphasis on teaching over testing, and time set aside to allow students to learn, process and grow. 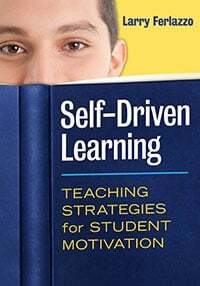 Trusting Teachers Is a Means to Authentic Parent Engagement is an interesting post by Kim Farris-Berg over at Education Week. Parents Add Heft to Bond, Tax-Measure Campaigns is an Education Week article worth reading. Though the specifics may differ from community to community, parents throughout the country are increasingly becoming advocates for bond and tax measures needed to fill budget holes and better the quality of schools. Their outreach often goes beyond knocking on doors, posting on Facebook, and running ads on local TV stations: In Baltimore, for example, the nearly three-year campaign included a 3,000-person rally and weekly parent bus rides to lobby state legislators in Annapolis, the capital. According to Michael Griffith, the senior policy analyst for the Denver-based Education Commission of the States, parents are vital in pushing local voters to pass both bond measures, which typically pay for lengthy infrastructure projects, and tax or levy measures, which pay for district operating expenses. Parent involvement at L.A. schools getting new look is an article looking at various ways parents are organizing around school issues. Parents’ campaign leads to reforms at Cudahy elementary school is an article in the Los Angeles Time describing a successful effort by parents and teachers to replace an ineffective principal. United Teachers Los Angeles also worked with parents, organizing meetings to help plan strategies. Mario Andrade, the union’s representative at Teresa Hughes, said 25 of the school’s 40 teachers had signed a letter calling for a new principal. The departure last September of a popular kindergarten teacher who no longer wanted to work with Cortez-Covarrubias helped spark the unified effort by teachers and parents to work for change, he said. Ingrid Villeda, the teachers union representative in the south area, said the Cudahy success offered lessons to union members to go beyond their insular concerns and work broadly with parents to improve their schools. She also said the efforts demonstrated that parent-led reform is possible without the controversial state parent trigger law, which allows parents to petition for changes at low-performing campuses but has been criticized for sowing discord and confusion. St. Paul’s teacher talks have been a public affair is the headline of a Minnesota newspaper article that shows why the work of the St. Paul Federation of Teachers, led by Mary Ricker, is a national model for parent engagement. The St. Paul district and teachers union negotiating teams have huddled behind closed doors in increasingly tense contract talks. But some of the most important conversations may have played out outside the bargaining room, where the two sides have curried public support and enlisted allies. Long before raising the specter of an educator strike, the St. Paul Federation of Teachers launched an outreach effort with parents and ramped it up as talks grew more contentious. Now, a parent campaign is pressing school board members to yield ground on educators’ proposals….. The St. Paul teachers union’s unprecedented outreach effort has gotten national attention. The federation invited parents and residents to book readings and discussions before it presented its contract proposals nine months ago. Then, when the district brought in a state mediator and the talks moved behind closed doors, the union intensified efforts to keep its proposals in the spotlight. Members knocked on doors. They produced videos featuring district nurses, counselors and social workers, whose ranks the federation wants to increase. The union made and distributed yard signs and launched an online signature drive. When families attended the district’s annual school choice fair, teachers were there to greet them and pass out fliers in several languages. Educators also invited parents to join them when they rallied in front of schools last month in support of the union’s proposals. That outreach seems to be paying off since union leadership this past Monday called for a strike vote. Parents have started an “I stand with SPFT” Facebook page, which quickly drew more than 900 members, including some teachers. On it, parents have shared contact information for board members and district administrators. They have urged each other to turn out for a union rally at the Feb. 18 school board meeting and have aired various frustrations with the district and questioned its cost estimate for union proposals. I’ve previously posted about why what’s happening in St. Paul, Minnesota is a national model of parent engagement. When a teachers strike loomed last month in the St. Paul Public Schools district, parents joined forces on Facebook, peppered the school board with emails and rallied in front of district headquarters. Now, some of those parents are asking: What’s next? Protecting Classrooms From Corporate Takeover: What Families Can Learn from Teachers’ Unions is a good article in YES Magazine that was written by Amy Dean. It’s gives a number of very good examples of teachers unions working with families and other community members. I’m a little disappointed, however, with the headline — it would have been nice to communicate that it’s a two-way street — we can learn from families, too. A New Teacher Union Movement is Rising is an article by Bob Peterson, head of the Milwaukee Teachers Union. It is no longer sufficient to just critique and criticize those who are attempting to destroy public education. Teacher unions must unite with parents, students and the community to improve our schools—to demand social justice and democracy so that we have strong public schools, healthy communities, and a vibrant democracy. I’ve written a lot about the tremendous parent engagement work of the St. Paul teachers union. They’ve come out with a must-read report on their work titled Power Of Community. What It Takes to Unite Teachers Unions and Communities of Color is an important article that appeared in The Nation. Karen Lewis Talks Protests, Politics & Getting Back in the Mix is a great interview over at EdShyster’s blog. What I kept saying was that *we need to build alliances with our natural allies, who are the parents. * Once we start building alliances with parents, then we stop blaming each other. Right now the system has us blaming them for not doing their jobs and not preparing their kids for school, and has them blaming us for being lazy or not doing what we need to do. Building alliances makes a difference because you’re stronger, because people can’t just pick you off. I’ve always talked about trying to recreate the strength of the union by sharing it with other folks who lack power. You might also want to explore the 780 other “The Best…” lists I’ve compiled.